I wrote last week that the global church’s task is to understand, live into, and speak truthfully about the character of the world in all its facets. The church calendar aids God’s people in this task, with seasons for celebration, expectation, lament, and hope. Consider also the canon of Scripture, with its variety of genres, and the many different kinds of psalms, including lament and praise. A great example of this is U2’s varied discography. In this interview with my friend Scott Calhoun, Eugene Peterson speaks about U2 as contemporary prophets. They have spoken in their prophetic voice according to the manifold character of creation, celebrating, exhorting, crying out against injustice, meditating, and lamenting. And they have shaped their albums according to a canonical logic. 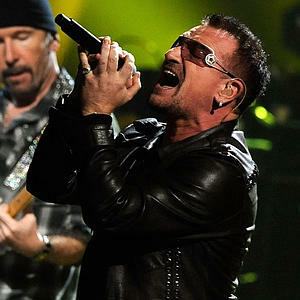 In One Step Closer, Christian Scharen described U2’s exploration of wisdom themes throughout the 1990’s. They mocked the shallow pretensions of contemporary life with enthusiasm on “Achtung Baby” and “Zooropa.” “Pop,” however, released in 1997, represents the sober tones of wisdom. The album contains several laments, ending with the searing “Wake Up Dead Man,” an adaptation of Psalm 44. That song leads off the album “All That You Can’t Leave Behind,” which is an album-length meditation on the goodness of creation. The album is framed by “Beautiful Day” and “Grace.” The dynamic of grace invites humanity to live into and enjoy creation’s beauty despite its brokenness. The album’s songs celebrate aspects of life and love. We might even say that the album considers life from the “already” aspect of salvation. Their next album, “How to Dismantle an Atomic Bomb,” is an album-length meditation on creation’s brokenness. It is framed by “Vertigo” and “Yahweh.” It opens at the fall and the shattering of the human, leaving humanity in a condition of confusion. It closes with “Yahweh,” a beautifully simple prayer for rescue and release from this corrupted condition. Each song ponders the mysterious, painful, and darker aspects of human experience, and we could say that it considers life from the “not yet” aspect of salvation. It builds toward the prayer at the album’s conclusion. Like good artists and faithful prophets, U2 follow the contours of the Psalms and the entire biblical canon in considering life from every perspective. As Scharen says in his book, there’s something about them that appeals to people of faith. To my mind it’s their sense of vocation in truly leaning into and giving voice to the character of creation as beautiful but broken. I enjoy these posts intersecting my favorite band with theology. Love this post, dude. An elder at my church digs your blog and sent me the link! Very well thought out. I have no original thoughts…I will just echo Preston’s sentiments. Great take on modern prophets, it rings of Andy Crouch’s article in the WSJ after Steve Jobs’ death. Thanks for sharing your insight. That’s absolutely one of my favorite moments from their last tour. See it here: http://www.youtube.com/watch?v=ebHOVTCUDso. You think this was a conscious process on the part of U2? I’m not sure about the overall decades-long body of work, but album to album, the shaping of them is very conscious. When you pay close attention to this and then put it together with things they drop in concerts, you’ll be quite surprised at how many levels they’re working. If you want simple rock-n-roll, it’s there. But when you start to peel the layers away, there’s just a whole lot more going on.